This Guide is for what comes next. The 2016 Indivisible Guide was about using constituent power to defend our values, our neighbors, and our democracy. This Guide is about using our constituent power to go on offense. We resisted. We retook power. And now, with control of the House of Representatives, we will stand indivisible to remake this country. The following pages offer a road map for the next two years of our journey. Together, we will pave the way to the post-Trump era. Together, we will win. 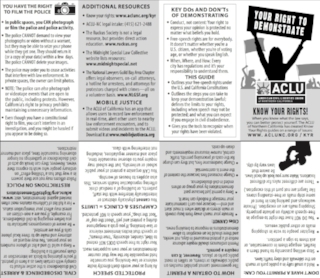 The ACLU has put together a pocket guide to knowing your rights as a demonstrator. Just download the guide, print and fold! This ACLU publication is a 19-page document detailing our rights to free speech. Download as a PDF here.